For a trail map, click the image above. Fox Hill Nature Preserve is located in the heart of Wisconsin’s Kettle Moraine region (SW of West Bend on Highway NN) between the States northern and southern forest units. The property features excellent examples of the geological features that are the result of the glacial retreat. 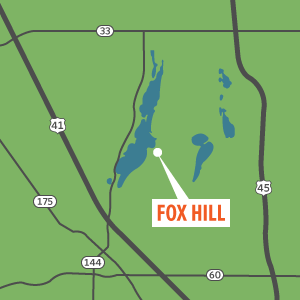 Fox Hill has more than 5 miles of hiking, snowshoeing, and cross-country ski trails, all for public enjoyment. The approximately 145-acre site also includes as a native prairie with over 50 varieties of plants, and a self-guided hiking trail with signs explaining the various geological and biological features of the area. Parking is available at 4200 Sleeping Dragon Road, approximate 1/2 mile east of Highway NN. The Conservancy on this ecological jewel protects important sensitive habitats and rare species. Please enjoy your visit and tread lightly. Quiet visitors may catch a glimpse of some of the many reasons to preserve natural areas in our watersheds. Expertly groomed Nordic ski trails are located on the Preserve. The ancient kettle moraine landscape with its ideal rolling terrain, combined with classic and skate lanes, allow you to cruise smoothly through the woods. 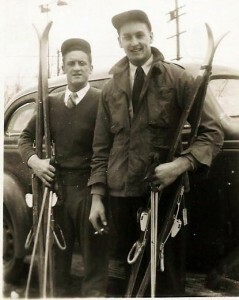 Skiers are encouraged to join CLCF Nordic. This is a membership category within CLCF that provides a parking area and shared trail maintenance. At Fox Hill in springtime, the woods are alive with flowers and bird song as the dawn chorus returns to the land. In the upland forest are some of the finest ephemeral wetlands in Washington County. Ephemeral wetlands are depressional wetlands that temporarily hold water in the spring and early summer. These isolated “Kettle” ponds are critical for the successful breeding of amphibians and invertebrates. This is an ideal time and place to quietly hear the spring peepers. Summer is the perfect time to take a hike on the trails, smell the prairie flowers, sit in the shade under the big trees, take in the vista overlooking Big Cedar Lake and spend some time with a beautiful piece of land. In Autumn, take a walk on a crisp mornings as the trees begin to dial up the hues of gold and red. The prairie is ablaze with flowers and the hillside maples and oaks are glowing with a changing palette. There are a number of old apple trees in the orchards there, grab a heritage apple and take a bite of sunshine. Trail use is intended for the quiet and safe enjoyment of all who visit. For that reason, motorized and non-motorized vehicles are not allowed. This is a wildlife sanctuary, so hunting is prohibited. During the winter months, hikers are asked to keep off groomed ski trials. Additional trails are available for hikers and snowshoe enthusiasts. In 1971 John Timmer sold 18 acres, containing the drumlin’s steepest slopes, to the Milwaukee Ski Club for private use by its members. At that time Fox Hill was an excellent rope tow ski area in the community. However in the 80’s competing slopes boasting artificial snow and chair lifts threatened the future of both the ski club and Fox Hill. Cedar Lakes Conservation Foundation secured both when it bought the development rights to the land in 1989. With the ski club still intact, Fox Hill became the cornerstone property of what would grow to become the Klingler Fox Hill Nature Conservancy. In 1992 the Foundation purchased an adjacent 40 acre parcel, followed in close succession by another 40 acre parcel and a 35 acre parcel, in 1993 and 1994. These later two parcels were purchased with the help of matching DNR funds, and a generous donation from Helen Klingler in memory of her husband Charles. The final ten-acres of the Conservancy were donated in 1998.